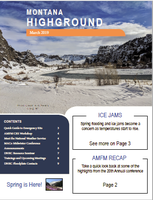 The Highground Newsletter is a quarterly publication of the DNRC Floodplain Program. To subscribe to the newsletter or to contribute content, please email Worby McNamee, Highground Newsletter editor. Click above to access the February 2019 Highground Newsletter.